Hi everyone! I’m super excited to be back visiting with Jenny today because I have a special dish that I prepared for the first time and I was so pleased with the results! Have you ever had a dish in a restaurant and thought that you’d like to create it at home but you weren’t quite sure if you could do it? This time I didn’t hesitate and just went for it. What’s the worst that can happen? You blow it and have to order pizza? That’s not always a bad thing! 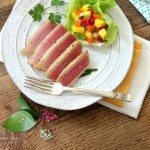 I’ve always loved the look and flavors of yellow fin tuna but given that it’s eaten rare, I was a little reluctant to try cooking it. I used to feel the same way about mussels and now I cook them at least once a month. Some dishes seem intimidating but when you examine the cooking methods, they are often the most simple. This comes together so quickly that you should make your salsa ahead of time because dinner will be ready before you know it. Your kids may look at this a little quizzically the first time but after the first bite, they’ll be converts. Like salmon, tuna has loads of healthy omega 3’s so it would be a great addition to your meal rotation. This is like cooking a steak. Simply season and place the tuna steaks in your pan on medium high heat or on the grill rack directly over medium coals. Cook, uncovered, for 4 to 6 minutes per 1/2-inch thickness or until fish begins to flake when tested with a fork but is still pink in the center, turning once halfway through cooking. I brushed the tuna with a little olive oil after turning just because well … it seemed like a good idea at the time. The fresh, zesty taste of the mango salsa is a great match and you’ll be convinced you’re in that expensive restaurant paying $35.00 a plate. And we all know the wine is much cheaper at home, too! Tuna can be expensive so look for the sales but be cautious. Sometimes those sales mean they’re trying to get rid of old fish rather than a large inventory. 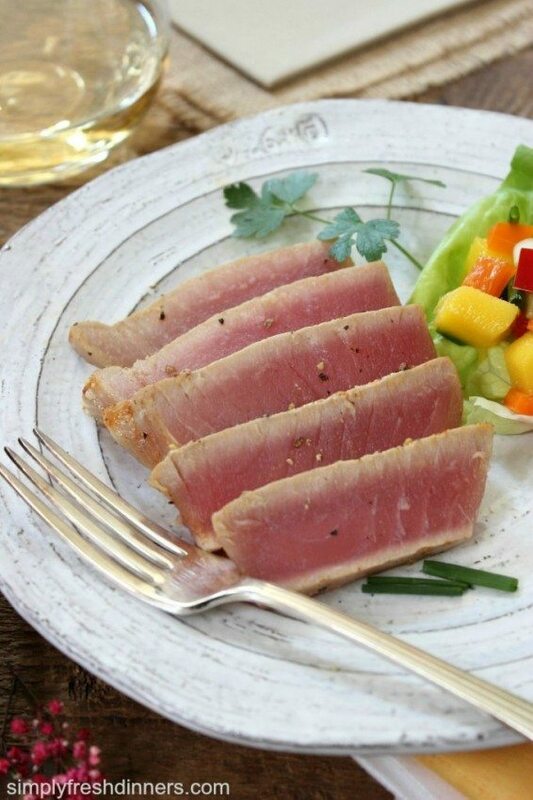 The best cuts of tuna are bluefin, yellowfin, bigeye and albacore. The best tasting ones will vary in color from deep red to pink. Look for moist (but not wet or weepy), shiny, almost translucent meat. This means the steak is fresh and newly cut. If they look brown, they are old. Something else to watch for is ‘gapping’ – when the meat of the muscle starts to separate into flakes. This is also a sign of old age. If you’re still not sure, ask the fish monger for a smell – it should smell like fresh salty sea air, not overly fishy. I hope you’ll try this and let me know how you like it. I also love to post readers’ pics of their creations on my blog so come visit and share. 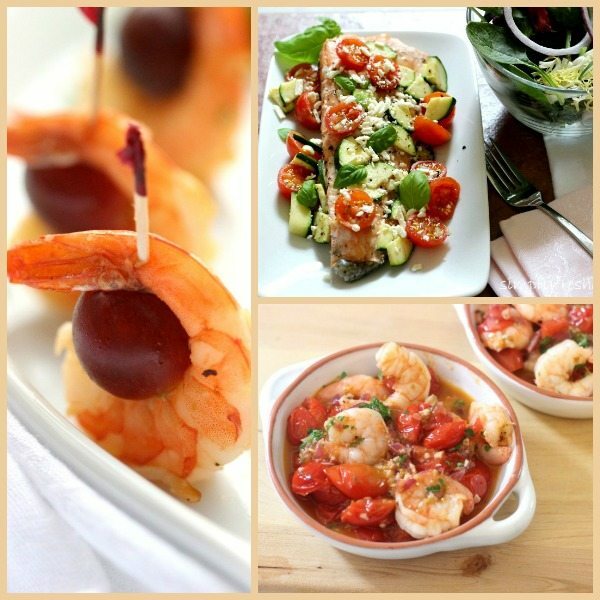 A quick, easy and elegant dinner that's full of nutrients, too! Mix grapeseed oil, chili powder, garlic, paprika, salt and pepper in a small bowl and set aside. Brush each tuna steak with herb mixture, patting into fish with fingertips. Cover and refrigerate for 1 hour. For mango salsa, mix grapeseed oil, lime juice and cilantro in a medium bowl. Stir in mango, bell peppers, onions, chives and jalapeño. Season with salt and pepper. Set aside. Heat skillet over medium heat. You should not need extra oil for cooking because the fish was marinated in oil. Place tuna steaks in pan and sear, about 2-3 minutes per side depending on their thickness. Don't overcook, it should be pink on the inside. Transfer tuna to a cutting board and let rest for 5 minutes. Slice against the grain. Arrange the lettuce leaves on each plate and top with mango salsa. Place sliced tuna on the side. Hello Jenny and Robyn, I hope you are doing well. Loving this simple and light dish, perfect for the summer. It is mango season here in Asia and a good time to make these beautiful dishes. I might even try your recipe with jack fruit as that is in season and delicious. Have you ever had jack fruit? Wishing you both a lovely weekend. Sharing and pinning, of course! What a beautiful dish! 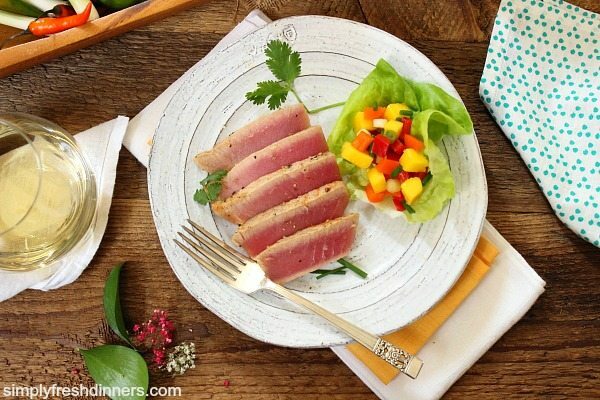 I love the combination of flavors in the salsa – so perfectly paired with the tuna! Thanks, Marissa. I had a feeling you’d like this. I think we have the same taste buds! Thanks, Marissa. I had a feeling you’d like this dish. I think we have the same taste buds!